Gauge is the measure of distance between the railroad rails. The distance is usually measured from the inside top edge of the parallel rails. Standard gauge probably in many countries of the world is 1435 mm. This measurement was developed by George Stephenson, a British railway engineer, using the width of coal wagons that were in use before the invention of the steam locomotive. In the United States, gauge can vary slightly between 4 feet, 8.5 inches to 4 feet, 9.5 inches (1,460 mm). All rail cars and locomotives built to this specification can use any standard gauge railroad line in the world. However, not all railroads have been built to standard gauge. 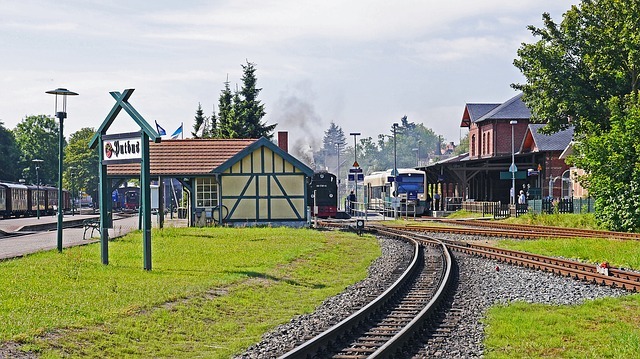 Some railroads use smaller distances, known as narrow gauge railroads. Narrow-gauge railways are cheaper to build and better adapted to mountainous terrain. Some narrow gauges are in use in mining operations, and in short-run railroads that must account for sharp curves and steep slopes. However, narrow-gauge railways are limited in their weight capacity and operating speed. Broad gauges are useful for heavy loads and higher rates of speed. Broad-gauge railways are standard in Russia, Finland, Ireland, India, Sri Lanka, Pakistan, Nepal, Bangladesh, Portugal, and Spain. When different gauges adjoin, for example at a nation's border, a break of gauge occurs. Some lines solve the problem by building dual gauge lines, which contain several different rails on a single rail bed for different gauges. Dual-gauge railways are in use in Australia, Argentina, Brazil, Vietnam, and Switzerland. Some locomotives and rail cars are built with adjustable wheels that can adapt to different gauge sizes. For different gauges, there will require a station consist of duplicate facilities such as platform, siding etc.